I’m a UK psychotherapist and researcher working exclusively with clients struggling with overeating issues. 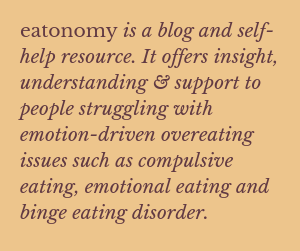 I’m part of a small team of dedicated, hard-working therapists and counsellors at a busy eating disorders charity, and I also work in private practice. After decades of overeating and bingeing, failing diets, weight loss and weight gain, I have managed to normalise my eating and now enjoy a peaceful relationship with food. My aim is to help others to do the same. I use the term “emotion-driven overeating” to encompass the overeating spectrum that includes emotional eating, compulsive eating and binge eating disorder. I wanted something that attempts to convey the urge to eat that only people with these kinds of issues can truly understand. I originally started this blog as a resource for clients but I’m really happy that what I write seems to strike a chord with people all over the world. I’m incredibly grateful to everyone who reads, likes and comments on my posts – your stories touch me more than you will ever know. Thank you. Last year, Rory at A Guy Called Bloke very kindly asked me to participate in the “Truly Inspired” series on his excellent blog. You can click here to read the results. Hi Deepa, thank you so much for reading, I hope my posts are useful. Blessings to you as well. Best wishes, Julie. I’m so interested that what I write resonates with you but you don’t have overeating issues, that’s really good to know. I’m glad you like my blog, I enjoy writing it – I look forward to reading more of yours, many thanks. I’m SO looking forward to your posts to help me understand myself with greater depth. Fortunately, I have reached a stage where I am kinder to myself, I love myself more and understand my demons…. and we all have them, some more obviously than others. Kind regards and warm wishes from Kavitha in South Africa. It’s great to hear that you are being kinder to yourself and that you love yourself more – that’s what you deserve. If my posts help you to build on your understanding then I will be very happy indeed. Thank you so much for your comment – I love your blog and am looking forward to reading more of your posts. Very best wishes to you, Julie. Great idea Julie. Rory is a wonderful guy who helps many. One of these days I might need help with overeating again, but for now my biggest problem is the choking caused by my MS. It prevents all forms of OVER eating, and at times all eating. Strangely enough, the very second I begin choking on my food is the moment I realize I’m as full as I need to be! Seriously, I just wanted to thank you for reading my blog, infrequent as it is lately. MS is not a nice playmate! Have a good weekend. I was so sorry to read that you’ve had MS from such an early age and the problems that it’s now causing you with eating. It’s a pleasure to read your blog – it doesn’t matter to me if you post infrequently, it’s always worth reading. Thank you so much for your comment. Thank you, Julie. At least now when most of my siblings are having memory problems because of advancing age, dementia and other things of that nature I will never have that problem. My memory problems are all caused by MS! 😇🤣And I love pointing that out to them, even though sometimes I forget if I remember to mention it or not. Smile! Hi! Nice to meet you! I am living in Ireland, I have dissociative identity disorder, ptsd and I am blind. I hope to connect with you on here. Many blessings, have a great day! Lovely to meet you, Carol Anne. Thank you so much for taking the time to stop and leave a message. I’ve just followed your blog so I’m looking forward to reading your posts. Blessings to you too!